Host Evan Golden on the red carpet with Miami International Film Festival Executive Director Jaie Laplante. Jaie Laplante (born January 8, 1970, Alberta, Canada) is a Canadian screenwriter, actor and curator. Laplante’s notable credits include co-screenwriter of Sugar, for which he received a nomination in the Best Adapted Screenplay category of the 2005 Academy of Canadian Cinema & Television’s 25th Genie Awards, along with co-writers John Palmer and Todd Klinck. As an actor, he appeared in Frisk,directed by Todd Verow. 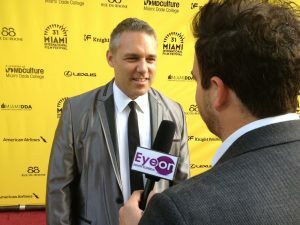 Laplante is currently executive director and chief curator of Miami International Film Festival, which he has programmed since 2010.